The Advanced Options for Strategies, which include the seven StormGuard Options shown to the right. These StormGuard Options are located on the Strategy Information popup window accessed by clicking the icon next to the Strategy's name on the My Strategies page. Click the button to expose them and make your selection. In addition to the six methods for detecting the onset of a bear market, the Bear Symbol provides a method for determining which investment should be held during bear markets by specifying its ticker symbol. Although $CASH (a generic symbol used to mean "your favorite money market fund") is the default symbol, you may use any other ticker symbol of your choice including those for; (a) ETFs and mutual funds, (b) extended history symbols, (c) ready-made Bear Market Strategies, or (d) the special ticker symbols referencing one of your own Strategies as described in more detail in the Bear Market Symbol materials. StormGuard-Off turns off StormGuard so that it is possible to use inverse ETFs and other inversely correlated funds as an improved means to do well during down-markets. Since StormGuard overrides the decision of the stock/fund selection algorithm, it must be disabled in order for inverse funds to be selected during down-markets. 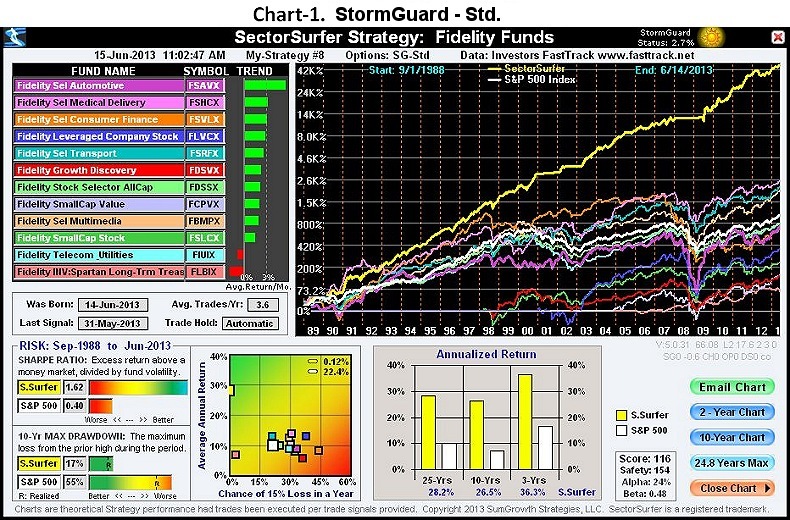 It is noteworthy that long-term treasury funds, such as FLBIX, VUSTX, TLT, and UBT (and many others) are generally inversely correlated to the S&P 500 and can be successfully used to improve performance in Strategies that StormGuard Disabled. However, for reasons described in the Common Mode Noise Reduction section, it is actually much better to use treasury funds in conjunction with a well-designed Bear Market Strategy controlled by StormGuard-Armor. StormGuard-Std. refers to the standard version of StormGuard. StormGuard-Std will only move into or out of $CASH at month-end, and will additionally respect specific extended minimum hold periods for mutual funds if the Trade Automatic setting has been selected. While it is not unusual to be anxious about moving to the safety of $CASH when markets are falling and thus to believe that the month-end trading limitation is less safe. However, the opposite is actually true. Backtesting shows there is actually a slight performance advantage when trading to/from $CASH only at month-end. However, if you are the anxious type, you may prefer to use StormGuard-AQR, which breaks does not abide by that rule. StormGuard-AQR (Asymmetric Quick Response) is a more aggressive StormGuard that; (a) "comes out of the hole" sooner following a market selloff, (b) triggers sooner by not adhering to month-end trading rules, and (c) does not honor fund-specific trade hold rules. Its only limitation on moving to/from $CASH is that the last trade in the Strategy must have been at least 15 days ago. The asymmetric timing design is predicated on the observation that major market selloffs begin slowly, but after bottoming, typically rebound much more quickly. Capturing more of the fast rebound is the objective. Because of its faster response, S.G.-AQR is also prone to having about twice as many trades to/from $CASH. It is not uncommon for an initial market rebound to fail and for S.G.-AQR to take the Strategy back to $CASH again for a while. StormGuard-Armor is our most advanced market direction/sentiment indicator, and was designed with a primary focus on ultimate safety without sacrificing any performance - and that objective was met and exceeded. While all other StormGuard option algorithms are based on measuring the trend of the S&P (in one manner or another), SG-Armor adds two additional views of the market when making its decisions: (1) market volume, and (2) new highs/lows. These additional measures of "market internals" are kind of like adding the senses of hearing and seeing to feeling. These measures betray changes in behavior of important investor classes before it starts to affect market prices. Seeing or hearing that a rough patch of road may be ahead provides time to react before you start feeling the presence of that rough patch of road. Additional technical details and performance information on this extraordinary version of StormGuard can be found on the StormGuard-Armor page. StormGuard-Armor only triggers on month-end and will respect other trading limitations provided under the Trade Automatic setting. StormGuard-Dr.Don's is a market direction indicator developed by Dr. Don Gimpel, long term president of the Las Angeles AAII Chapter, using the SMA 75/300 day crossover on SPY to determine when to get out of the market, and the SMA 50/200 day crossover to determine when to get back into the market. As implemented in SectorSurfer, it triggers only month-end. StormGuard-Death-X (Death Cross) has been the standard market direction indicator of the industry for decades. It is the SMA 50/200 day crossover of the S&P500, and is called the Death Cross on the way down and the Golden Cross on the way up. As implemented in SectorSurfer, it triggers only month-end. It is provided as a performance comparison base. In a careful examination of the difference between Chart-1 (S.G.-Std.) and Chart-2 (S.G.-AQR) below, one can see that in both of the mid-2003 and mid-2009 market recoveries, a greater portion of the market rebound is captured with S.G.-AQR resulting in an increase in the average annual return from 28.2% to 31.2% - which translates to about an 30% additional return improvement related to each of those major recovery events. That performance improvement may justify paying an occasional early trading fee if a fund needs to be sold early. Please Note: StormGuard-AQR doesn't perform better on all Strategies. In order for it to be helpful, the Strategy algorithm must select something at that time which is rebounding aggressively out of the hole. For example, if your strategy includes a bond fund that was currently being held, then there will be little difference between buying back in to that bond fund versus continuing to hold $CASH a bit longer. In one particular examined ETF Strategy that was not helped by S.G.-AQR, the reason identified was that the algorithm had chosen the GLD ETF at that time, and GLD was fairly flat in performance when the market was otherwise seriously rebounding. 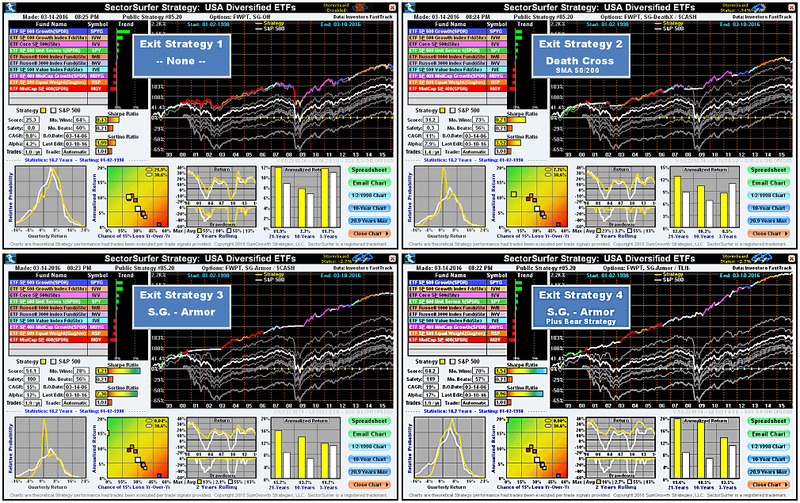 The four charts below are for the same Strategy composed of a set of well diversified US ETFs (SPY, MDY, etc. ), but each using a different StormGuard exit strategy. Exit Strategy #1 has StormGuard-OFF, and one can easily see the ravages of the 2008-2009 bear market in the equity curve. Exit Strategy #2 uses the well-known Death Cross to exit the market to $CASH when the SMA 50/200 day crossover occurs, and offers a marked improvement over doing nothing. Exit Strategy #3 uses StormGuard-Armor to exit the market to $CASH, and clearly is superior to the Death Cross. Finally, Exit Strategy #4 uses StormGuard-Armor in conjunction with the TLH (a 10yr treasury ETF) as the Bear Symbol (alternative to sitting in $CASH) and leaves the others in the dust. Please review the Bear Market Strategies page for a discussion on how hindsight selection bias can be avoided during bear markets using a well-designed Strategy that selects from a diverse set of asset classes that often (but not always) do well during a market crash.